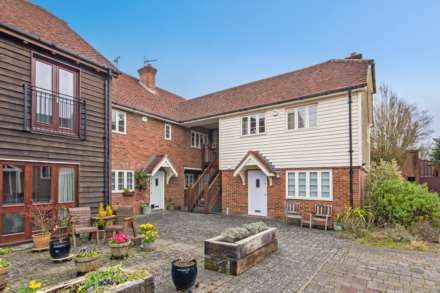 Tucked away on a peaceful cul-de-sac this smart mews town house is also a stone`s throw from excellent schools, superb transport links and the town centre`s shops and restaurants. Its exclusive setting is apparent from the smart communal gardens and pathways that wind round the modern development. The home`s warm brick exterior blends with the contemporary cast iron balcony and leafy surroundings. As you step into the hallway, with a useful guest cloakroom on your right, you can see right through to the glorious garden at the rear through an expanse of glass. First on your left is the well-designed kitchen with contemporary grey flooring contrasting beautifully with pale yellow cabinets and black worktops. Integrated appliances include the fridge/freezer, electric oven with 4 ring gas hob above, stainless steel extractor fan and Neff dishwasher. At the rear, the bright living room/dining room is flooded with light from its French doors bringing views of the garden in. It is safely enclosed for children and pets with a lawned area and a paved terrace perfect for dining and entertaining in the warmer months. Climbing the stairs to the first floor there are three bedrooms, two of which are generous doubles. The master bedroom benefits from an en-suite shower room, a fitted wardrobe and access onto its pretty balcony. A large modern bathroom with a shower over the bath and landing with an airing cupboard with shelving to warm linen completes the floor. This home is a real gem offering the best of both worlds, a central location in a peaceful setting. A must see! Cloakroom: front aspect opaque double glazed window, low level WC, wall hung wash hand basin, radiator and wooden effect laminate flooring. Kitchen: 10`3 x 8`2 front aspect double glazed window, tile effect laminate flooring, integrated Siemens electric oven with 4 ring gas hob above, stainless steel extractor fan, stainless steel splash back, integrated fridge/freezer, integrated Neff dishwasher, stainless steel 1 ½ sink with drainer and mixer tap over and radiator. The kitchen has plenty of worktop space and a good selection of pale yellow eye and base level units, a wall unit housing the boiler and space for a breakfast bar. Living/Dining Room: 16` x 14`5 rear aspect double glazed windows with rear aspect French windows opening into the garden, radiators and deep under stairs storage cupboard housing the fuse box. En-Suite: tile effect laminate flooring, low level WC, double walk in shower cubicle with wall mounted shower attachment and folding glass doors, heated towel rail, part tiled walls and wall hung wash hand basin with mixer tap. Bedroom 2: 12`3 x 8`10 double glazed rear aspect window and radiator. Bedroom 3: 8`4 x 5`7 double glazed front aspect window and radiator. Bathroom: rear aspect opaque double glazed window, part tiled walls, wooden panel enclosed bath with wall mounted shower attachment and mixer tap, wall hung wash hand basin with mixer tap, heated towel rail, low level WC and tile effect laminate flooring. 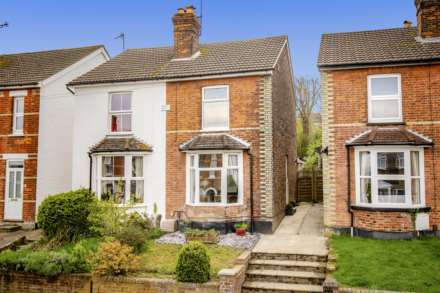 Outside: there are areas of communal garden and pathways surrounding the property`s road where the property is fronted by a block brick and paved off street driveway with parking for two cars. To the rear is a paved terrace, perfect for a table and chairs, and a lawned area beyond with mature stocked flower beds. The garden is secure and private with close boarded wooden fencing at all perimeters and a rear wooden gate giving street access for bins and general needs.